When it comes to wooden flooring, there’s nothing quite like the real thing. So, if you’re looking for a luxurious selection of solid wood flooring, here at Factory Direct Flooring we offer a range of styles to suit any room, at competitive rates. Browse our collection below or read on for more information, including how to install and care for your solid wood floor. Solid wood is one of the most popular types of floors. This is because nothing quite beats the luxury of real, solid hardwood. However, because of its popularity and quality, solid wooden flooring is often more expensive than engineered wood or laminate, which only imitate hard wood flooring. While the cost is usually more than other floor styles, cheap solid wood flooring does exist. And despite the minimal cost, you can still expect longevity with this type of floor. Where Should You Lay Your Real Wood Floor? While real wood flooring looks great in every room, there are certain guidelines you should follow to avoid excessive damage. Primarily, this hardwood flooring is not suited to rooms which will see a lot of moisture, for example bathrooms. This is because wood will absorb water and expand, which will ruin the overall appearance of your floor and weaken the floorboards. You’d be better with a solid wood living room floor, or one in a bedroom, or office. Solid wood flooring is available in four different grades, all of which have their own unique qualities. For example, they differ by the number of knots – these are the oval shapes you often see in certain types of solid natural wood flooring. Classic or select grade flooring is free from sapwood, so you won’t find any knots. There is also little variation between each board of this hardwood flooring. Prime grade flooring has very few knots and has little variation in colours throughout the whole pack of floorboards. Rustic grade flooring offers the full characteristics you’d expect of wood, including knots varying in size and shape, shakes where the wood has split, sapwood and a significant variation in colour between each board. Finally, natural grade flooring is the balance between rustic floorboards and prime flooring. As it features more knots than most floorboards, but not as many as a rustic floor. One of the most important steps of installing your new floor is allowing it to acclimatise before you start to lay it. Moisture in the air makes floorboards expand slightly, so you’ll need to let the floor get used to the room first. We recommend leaving your flooring out of its packaging, in the intended room, for roughly one week before installing. Make sure your subfloor is completely clean and dry before laying your new floorboards. Use a pre-glued solid wood flooring underlay to make the process easier. Start from the left-hand corner, fixing each board down with either glue or nails as you go. With either method, ensure you leave a gap of roughly 15mm around the perimeter of the room to allow for skirting. If you’re using glue and have not opted for a pre-glued underlay, apply the glue to the subfloor and not the panels. Spread this evenly using a notched trowel and place your board firmly on top, wiping away any excess glue. If you’re using a hammer and nails, insert these at a 30-degree angle into the tongue of the board and the subfloor. Once your boards are neatly stuck down, simply add the skirting to the expansion gap around the room. Fix this into place using a hammer and nails. Once your hardwood flooring is complete, most flooring companies would recommend applying a finish or varnish. This acts as a barrier to protect your floor against any spillages, however, it also creates a beautiful sheen over the wood. Use a lacquer or varnish and apply using a brush. The benefit of a solid wood floor, instead of engineered or laminate, is that if your floor undergoes excessive damage, you can simply sand away the damage to reveal a good-as-new floor underneath. This is the best way to deal with any dents or scratches. After sanding, ensure you refinish the floor to keep it protected. Finally, to keep your floor clean, it’s recommended to sweep away any dust or dirt as often as is possible. If your floor is particularly dirty, use clean or distilled water on a mop. However, use as little water as possible to avoid damage. Factory Direct Flooring has been operating online since 2005 and has since built up a reputation for providing excellent hardwood flooring solutions, alongside customer service. So, if you have any further queries about our solid wood floors, please contact us on 0330 100 00 15, or request a free sample. 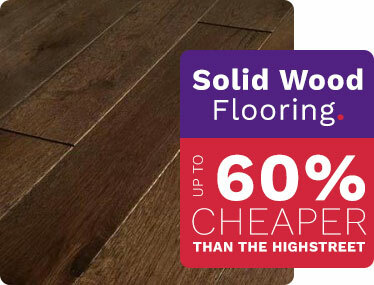 And remember to keep an eye out for our solid wood flooring clearance sales. Why Is My Solid Wood Floor Creaking? What is the Best Solid Wood Flooring?